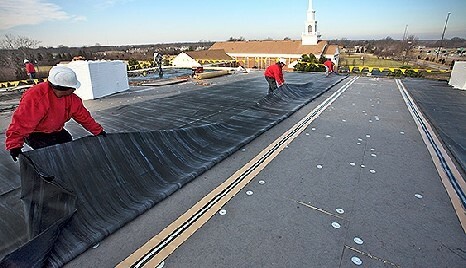 For more than 40 years, Cox Roofing Systems has been installing single ply membrane systems. As an approved Firestone contractor, we offer two single ply Firestone roofing membrane systems which are Thermoplastic polyolefin (TPO) and Ethylene propylene diene monomer (EPDM). Made of synthetic rubber compounds, these Firestone flat roofing types are durable and weather-resistant. TPO and EPDM can be used in different geographical locations regardless of the climate. Firestone EPDM roofing membrane is known for its ability to withstand UV radiation as well as cold and hot temperatures in Ontario. It can be used in environments where the temperature ranges from -29C to 177C. Because of this extreme durability, this type of Firestone flat roofing can last up to 50 years. There is no need to use flame to install Firestone EPDM. Once the membrane adheres to the substrate, the bond cannot be broken if installed correctly. If you have equipment on your current Ontario roofing, you don’t have to worry about removing and reinstalling it since the EPDM rubber can simply be cut and sealed around it. Firestone EPDM roofing helps you reduce the use of air-conditioning and heating systems, thereby minimizing the release of greenhouse gases. According to studies, EPDM Firestone flat roofing, along with TPO, has the lowest potential to cause global warming, smog, and acid rain. As a newer Firestone flat roofing system, the TPO membrane helps the interior of your building stay cooler. Its high reflective properties prevent the absorption of heat from the sun. You don’t have to make your air-conditioner work harder and be faced with high energy bills later. If you are looking to have solar panels or a roof garden installed, TPO can be your best choice for a Firestone roofing membrane. This compatibility allows for a healthier, cleaner earth and supports your efforts to keep your building interior cool. Inexpensive and lightweight, the TPO Firestone roofing membrane resists UV damage, heat, mold growth, and dirt buildup, and some rooftop chemicals – all of which can speed up the deterioration of your Ontario roof. The thicker the TPO membrane used, the better.